Sebastiaen Vrancx, Sebastiaan Vrancx or Sebastian Vranckx (pronounced [ˈvrɑŋs]; 22 January 1573 – 19 May 1647) was a Flemish Baroque painter and draughtsman who is mainly known for his battle scenes, a genre that he pioneered in Netherlandish painting. He also created landscapes with mythological and allegorical scenes, scenes with robbers, village scenes and celebrations in cities. He was a gifted figure painter who was regularly invited to paint the staffage in compositions of fellow painters. Sebastiaen Vrancx was baptized on 22 January 1573 in the St James Church in Antwerp. His father Jan was a merchant. His mother was Barbara Coutereau. He was an apprentice in the workshop of Adam van Noort, who was also the master of other prominent Antwerp painters such as Peter Paul Rubens, Jacob Jordaens and Hendrick van Balen. It is believed that after finishing his apprenticeship, the artist visited Italy as he only became a master of the Antwerp Guild of Saint Luke in 1600. He commenced his career in Antwerp and gained the recognition of his fellow artists. He was particularly esteemed as a painter of battle scenes and Peter Paul Rubens is known to have owned a battle scene by the artist. In 1610 he was invited to join the elite Confrerie of Romanists, a society of Antwerp humanists and artists. A condition of admission was that the member had travelled to Rome. The diversity and high positions held by the Confrerie's membership offered him a good opportunity to meet with potential patrons. He was elected the dean of the painter's chamber of the Guild in 1611. Vrancx was a member and district head of the local civil militia from 1613 onwards and was in 1626 asked by the Antwerp mayor to serve a five-year term as the captain of the militia in return for a complete exemption from taxes and municipal services. The position entitled Vrancx to carry a sword. It was in a vigorous pose with a sword on his side that he was portrayed by Anthony van Dyck. Vrancx was a member of the chamber of rhetoric the Violieren, which was linked to the Guild of Saint Luke. He was very active in the chamber of rhetoric and when he served as its factor he wrote about 13 comedies and a number of poems. Vrancx collaborated with Jan Brueghel the Younger, Hendrick van Balen and Frans Francken II on an emblem for the Violieren for which the Violieren obtained a first prize in 1618. Vrancx met with personal tragedy when his wife and sole child Barbara died a few months from each other in 1639. He himself died on 19 May 1647 in Antwerp. The pupils of Vrancx included Peter Snayers who became a leading battle painter and Balthasar Courtois, whose work is virtually unknown. There is no clear view of the size of Vrancx' studio. In a letter of 1634, Jan Brueghel the Younger wrote to his business partner in Seville that: 'Vrancx has plenty to do but refuses to employ studio assistants, which means that work takes a long time. He does not allow copies to be put into circulation'. Sebastiaen Vrancx is now mainly known for his battle scenes, a genre he likely pioneered in Northern European art. His subject matter was, however, much wider than solely battle scenes. He painted landscapes with mythological and religious scenes, allegories of the seasons and months, city views, banquet scenes, village scenes, genre scenes, Brueghelian scenes and even architectural paintings. He is also known for a series of drawings depicting scenes from Virgil's Aeneid. He also produced designs for the Antwerp printmakers and publishers. Sebastiaen Vrancx was probably the first artist in the Northern or Southern Netherlands who created depictions of battle scenes. His experience as an officer and captain of the Antwerp civil militia may have played a role in his interest in developing this genre. Approximately half of his known works are devoted to military scenes. His first-hand experience in military matters likely inspired his treatment of the subject and supported his skill in the depiction of cavalry engagements and battles of the Eighty Years' War. Vrancx became a very influential figure in the development of this subject matter. 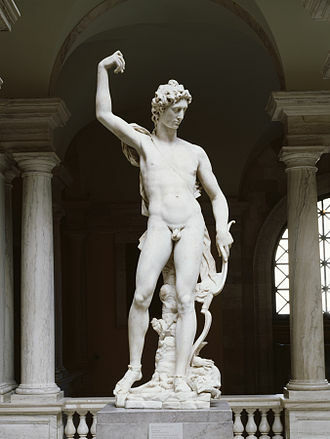 From the period 1611–25, his style had developed so that his landscapes and the figures in them showed the clear-cut and determined handling of form characteristic of his mature style. 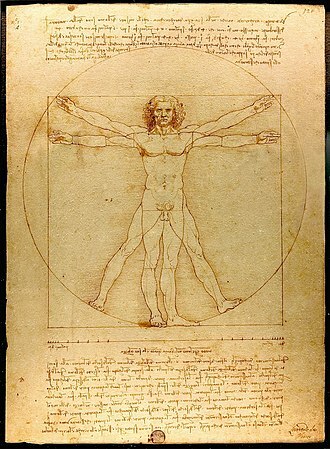 He achieved greater control of the representation of space and of large and more complex groups of figures. In his mature later period from the 1630s onwards his compositions were characterized by more attenuated and pearly tonalities and a less compact but more dynamic execution of the trees. Vrancx's mature style further features complex figure groups engaging within vast landscapes. One of the subjects to which he returned regularly was that of the Battle between Lekkerbeetje and de Bréauté on the Heath of Vught. The subject took its inspiration from an event that occurred on 5 February 1600 when an overly-confident young French commander by the name of Pierre de Bréauté was challenged to a duel by Spanish Cavalry Lieutenant Gerard van Houwelingen, known by his knickname Lekkerbeetje, after he supposedly claimed his own horsemen better than the Spaniard’s. The battle was fought on the Heath of Vught, a small wooded area near the town of Vught, between the town gallows and the mill. Each side had 21 horsemen armed with swords and pistols. Lekkerbeetje was killed at the start of the engagement with a single pistol shot. During the skirmish the French suffered a total of 19 fatalities. Pierre de Bréauté was caught and then killed by his opponents. The subject of this battle became so popular at the time because it celebrated the by then essentially defunct chivalric practice of duelling. A subject matter closely related to the military scenes are his scenes of assaults by robbers on travelers and of soldiers plundering villages. An example is the Attack of Robbers (the Hermitage Museum). The picture narrates a scene of travellers on horses attempting to ward off an attack of robbers. Many of his scenes of ambushes reflect the helplessness of the civilian victims. Vrancx had various followers in the southern Netherlands including Pieter Meulener, Jacques van der Wijen and Adam Frans van der Meulen, who was a pupil of Peter Snayers (a pupil of Vrancx) and later moved to France. In the northern Netherlands Vrancx’s influence can be seen clearly in the work of Esaias van de Velde and Pauwels van Hillegaert. Vrancx’s cavalry scenes remained conservative, comparable with those by Antonio Tempesta. Vrancx created various series of paintings representing the Four Seasons or the Months of the Year. In these allegorical pictures each month or season is characterized by the varying phases of the landscape and the associated human activities. These paintings were very popular in Flemish painting in the late 16th and early 17th centuries. 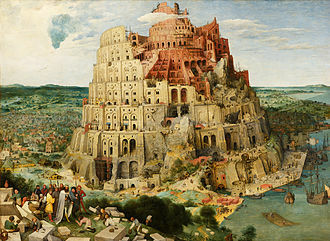 Pieter Bruegel the Elder founded the genre as an independent category of painting with his influential cycle of the Months painted for the home of his patron Nicolaes Jongelinck. Series of twelve panels of individual months, of six panels each representing two months, as well as sets of the four seasons were produced by a number of artists. In a set of the four seasons (auctioned at Christie's on 9 July 2015, London, lot 28) Sebastiaen Vrancx incorporated a number of stock motifs and charming details into the landscapes to represent the seasons. Spring shows an elegant boating party engaged in courtly love and peasants tending gardens, herding sheep and bleaching cloth. Summer offers a panoramic view of labourers at work, picnicking and bathing in a nearby pond during the harvest. Autumn is set in a farm courtyard where workers are busy picking apples and delivering bags full of harvested grapes to be pressed. Winter is set in a snow-blanketed hamlet on the outskirts of a walled city, where carnival revellers and ice skaters on a frozen moat. Sebastiaen Vrancx started his career in Italy by painting Mannerist cabinet-sized Biblical scenes that are reminiscent of Paul Bril and Jan Brueghel the Elder. After returning to his home country he turned to genre subjects. He created a number of village and city scenes. Some scenes depicted masked persons and may have been based on his experience as a writer for, and actor in, plays produced by the chamber of rhetoric. An example is A view of Antwerp by night with elegant figures on their way to a masquerade (at Christie's on 23–24 June 2015, Amsterdam lot 45). In this night scene Vrancx was able to capture the effects of moonlight and torchlight. The nocturnal ambiance is made palpable with naturalistic and keenly observed scenes such as the two cats in the centre shown as mere silhouettes and about to attack each other. The composition demonstrates his attention for the attire of the figures, an interest also reflected in Vrancx’ designs for a series of prints by Pieter de Jode I, which depict the dresses of various countries known as the Variarum Gentium Ornatus. He also painted the composition Uniformed monkeys and cats which falls into the genre of the singerie, which shows representations of monkeys engaging in human activities. In this genre the monkeys were often dressed in costumes which added comedy to the 'aping' by the monkeys of a specific human action (often vices) or occupation. Vrancx collaborated with the architectural painter Pieter Neefs the Elder. He added staffage to Neefs' church interiors. An example is the Interior of the Jesuit church of Antwerp (Kunsthistorisches Museum, Vienna). Neefs is considered to be a representative of the Antwerp school of architectural painting. Typical for the style was the use of a rigid linear perspective which offered a view directly down the nave of the church. Vrancx produced himself architectural paintings of church interiors. An example is the Interior of the Saint James Church in Antwerp (at Christie's on 14 April 2016, New York lot 108). Vrancx' composition depicts the lofty, light-filled interior of the Saint James Church in Antwerp, where a priest is giving a sermon to the masses while elegantly dressed onlookers walk around the aisle. He used a predominantly neutral palette to which he added carefully placed touches of cardinal red to bold effect, from the case of the hourglass perched on the priest's pulpit to the brilliant cape and stockings of the gentleman in the central foreground who serves as the painting's visual anchor. 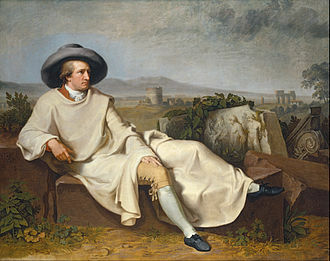 At the right a man holding a plumed hat and in lavender attire is leaning against the base of a column at right. He is gazing directly at the viewer with bemused confidence. The figure may be a self-portrait as he bears a strong resemblance to Anthony van Dyck's portrait of the artist. This composition does not use the rigid linear perspective view directly down the nave of the church, which was common in the works of the church painters of the Antwerp school. He worked with a number of other painters in Antwerp, such as Jan Brueghel the Elder, Jan Brueghel the Younger, David Vinckboons, Rubens, Frans Francken the Younger, van Balen, Frans Snyders and Joos de Momper the Younger. An example of a collaboration with Jan Brueghel the Elder is Assault on a Convoy (Kunsthistorisches Museum) in which Vrancx painted the figures in the landscape created by Brueghel. A series of 65 drawings recounting incidents in the Aeneid have been attributed to Sebastiaen Vrancx. Of these, 59 were part of a private collection until they were auctioned off at Drouot, Paris on 9 October 1981. Some of these drawings are now in the collection of various museums, including the Plantin-Moretus Museum, the Fogg Art Museum, the Yale University Art Gallery, the Morgan Library & Museum, the Metropolitan Museum and the Louvre. The drawings are dated to around 1615, or possibly a later date, about 1625–1630. Most of the scenes represented occupy the upper half of the sheet, the lower half being reserved for the text from the Aeneid. The upper part has been cut off in some drawings leaving only the illustration. 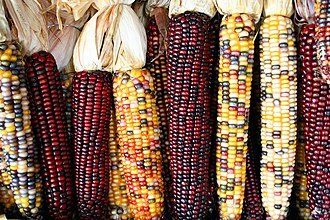 Whatever the case, the different compositions present a similar size. The handwritten narration is a Dutch translation of Virgil. It is not known if the translation was made by Vrancx himself. The translation was probably meant to be published and the illustrations engraved, but the project was apparently never carried out. In the Aeneid cycle drawings, Vrancx did not individualise the facial features. It is only through the actions in which the figures are involved that it is possible to identify them. Vrancx used short, angular strokes to outline the main elements in each scene. Chambers of rhetoric were dramatic societies in the Low Countries. Their members were called Rederijkers, from the French word rhétoricien and these societies were closely connected with local civic leaders and their public plays were a form of early public relations for the city. Most Dutch cities sponsored a chamber of rhetoric, and many cities had more than one, the building that currently houses the Frans Hals Museum was built with the proceeds of a lottery in which chambers of rhetoric participated from all over the country. The Haarlem society Trou moet Blycken still has many of the blazoens that it kept as host of that lottery. At the start of the 16th century, Antwerp had three societies, the Violieren, the Olyftack, and the Goudbloem, while Brussels. An important chamber of rhetoric in the Netherlands was De Egelantier in Amsterdam, Bredero, during the Protestant Reformation the society sided with the reformers against the city government and enjoyed its most blooming period despite receiving very little funding from official sources. Adam van Noort was a Flemish painter and draughtsman and one of the teachers of Peter Paul Rubens. Adam van Noort was mainly know for his paintings but he created some portraits. He was a designer for engravings for the Collaert family of printmakers and publishers, Adam van Noort was born and died in Antwerp. He was the son of Lambert van Noort from Amersfoort and Katelijne van Broeckhuysen from Zwolle and his parents had established themselves in Antwerp where Lambert became a member of the local Guild of Saint Luke in 1549. His father was primarily as a designer of stained-glass windows and engravings, an architect and, to a lesser extent. Adam van Noort probably initially trained with his father but must have had other teachers since his father died when he was still young and he was not registered with any other teacher in the records of the Guild of Saint Luke. He became a master of the Guild of Saint Luke in 1587 and he married Elisabeth Nuyts, with whom he had five children. Van Noort served as dean of the Guild of Saint Luke from 1597 until 1602 and he had problems with the Guild, which accused him of poor management of the accounts and misappropriation of materials of the Guild. Some other guild members objected to his actions and he was forced to substitute the panels, the commission to paint the substituted panels did finally not go to van Noort but to Maerten de Vos. A second conflict with the Guild arose from the fact that he did not settle his accounts in time after he ceased being a deacon of the Guild. Adam’s present-day fame largely rests on the fact that he was the teacher of two of the leading Flemish Baroque painters Peter Paul Rubens and Jacob Jordaens, Rubens only stayed for a little over a year and is not believed to have been influenced much by van Noorts training. 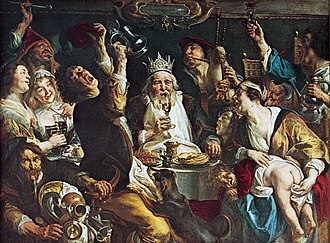 Jordaens married van Noort’s daughter Elisabeth and would influence the style of his teacher, the total number of pupils of van Noort was around 35. This attests to the fact that in his time he was a respected artist. He was successful and was able to acquire several properties in Antwerp. The other pupils of Adam van Noort include Hendrick van Balen, Ferdinand van Apshoven the Elder, Artus de Bruyn, Hendrik van der Eedt, Remoldus Eynhoudt, van Noort lived to an old age but likely ceased practising as an artist aroun 1630. Pieter Meulener or Peter Meulenaer, Antwerp), was one of the leading Flemish painters of battle scenes in the mid-17th century. He painted landscapes with genre scenes, Pieter Meulener was born in Antwerp as the son of genre painter Jan de Meuleneer and Elizabeth Floris. He was baptised on 18 February 1602 in Antwerp Cathedral and his grandfather was the Flemish Renaissance painter Cornelis Molenaer who was known for his landscapes. It is assumed that he was trained by his father Jan who had joined the Antwerp Guild of Saint Luke in 1598, Pieter joined the Guild in 1631 as a wijnmeester, which means he was the son or brother of a current member. He likely got married the year to Maria Hendrickx. SInce no early dated works have been discovered, it is likely he initially assisted his father in his workshop and he started out on his own account in 1642. He was successful as he was able to rent a luxurious residence, when he died in 1654 he was recorded as having one daughter of 20 years old and a son of 15 years old. 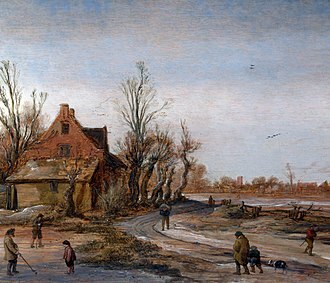 He was able to establish a reputation as a battle painter of battles but was known for his landscapes. His works are dated and signed with P. MEVLENER. He occasionally used the monogram PM, the works signed with this monogram have long been considered as by Pieter de Molijn. His works can be found in leading museums including the Prado Museum, the Hermitage Museum, the Rijksmuseum and the Louvre. His battle scenes depict cavalry skirmishes, attacks on convoys and on travellers, depicting those subjects from the Flemish side in the Eighty Years War. His preferred theme was cavalry engagements and his way of representing these was to place a dense cavalry skirmish in a certain area of the composition. His battle scenes show similarities with those of Sebastiaen Vrancx, the first Flemish artist to attempt this subject matter, some historians believe Meulener may have studied under Vrancx. His palette is closer to that of Pieter Snayers, who studied under Sebastiaen Vrancx, after 1645 his colour became clearer under the influence of Dutch battle scene painters, such as Pieter de Neyn, Jan Jacobsz. Flemish Baroque painting refers to the art produced in the Southern Netherlands during Spanish control in the 16th and 17th centuries. 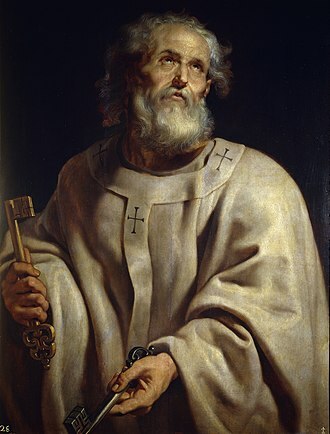 Antwerp, home to the prominent artists Peter Paul Rubens, Anthony van Dyck, Rubens, in particular, had a strong influence on seventeenth-century visual culture. By the seventeenth century, Antwerp was the city for innovative artistic production. 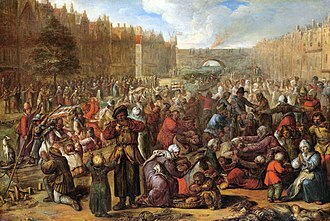 Brussels was important as the location of the court, attracting David Teniers the Younger in the century, between 1585 and the early 17th century they made many new altarpieces to replace those destroyed during the iconoclastic outbreaks of 1566. Also during this time Frans Francken the Younger and Jan Brueghel the Elder became important for their small cabinet paintings, often depicting mythological and history subjects. Following his return to Antwerp he set up an important studio, training such as Anthony van Dyck. Most artists active in the city during the first half of the 17th century were influenced by Rubens. 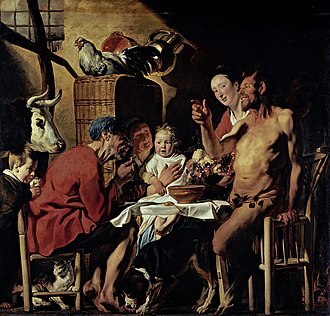 Flemish art is notable for the amount of collaboration that took place between independent masters, which was partly related to the local tendency to specialize in a particular area. Frans Snyders, for example, was a painter and Jan Brueghel the Elder was admired for his landscapes. Both artists worked with Rubens, who often painted the figures. In Antwerp, this new genre developed into a specifically Catholic type of painting, history painting, which includes biblical and historical subjects, was considered by seventeenth-century theoreticians as the most noble art. Abraham Janssens was an important history painter in Antwerp between 1600 and 1620, although after 1609 Rubens was the leading figure, both Van Dyck and Jacob Jordaens were active painting monumental history scenes. Following Rubenss death, Jordaens became the most important Flemish painter, during the second half of the century, history painters combined a local influence from Rubens with knowledge of classicism and Italian Baroque qualities. Artists in the vein include Erasmus Quellinus the Younger, Jan van den Hoecke, Pieter van Lint, Cornelis Schut, in the century, many painters turned to Anthony van Dyck as a major influence. Adam Frans van der Meulen was a Flemish Baroque painter specialising in battle scenes. He was active first in Brussels, where he was a pupil of Pieter Snayers, van der Meulen was trained by the Belgian court painter Pieter Snayers of Brussels. His first work as an independent artist was done in Brussels and he painted genre and history pieces. He joined the guild in his native city, Brussels. His paintings during the campaigns of Flanders in 1667 so delighted Louis that from that date van der Meulen was ordered to him in all his expeditions. In 1673 he was received into the Académie royale de peinture et de sculpture, attained the grade of councillor in 1681, according to Houbraken, he was famous for his battle scenes, before being invited to France. After his first wife died, Le Bruns cousin fell in love him and he dared not refuse her. He was buried in the St. Hippolyte church in Gobelins and he is best represented by the series of twenty-three paintings, mostly executed for Louis XIV, now in the Louvre. An artist is a person engaged in one or more of any of a broad spectrum of activities related to creating art, practicing the arts or demonstrating an art. The common usage in everyday speech and academic discourse is a practitioner in the visual arts only. The term is used in the entertainment business, especially in a business context, for musicians. Artiste is a variant used in English only in this context, use of the term to describe writers, for example, is valid, but less common, and mostly restricted to contexts like criticism. Wiktionary defines the noun artist as follows, A person who creates art, a person who makes and creates art as an occupation. A person who is skilled at some activity, a person whose trade or profession requires a knowledge of design, painting, etc. 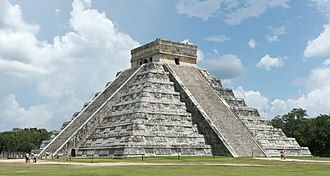 The adjectival Latin form of the word, became the source of the English words technique, technology, in ancient Greece sculptors and painters were held in low regard, somewhere between freemen and slaves, their work regarded as mere manual labour. The word art derives from the Latin ars, although literally defined, means skill method or technique, and conveys a connotation of beauty. During the Middle Ages the word artist already existed in countries such as Italy. An artist was able to do a work better than others, so the skilled excellency was underlined. In this period some artisanal products were more precious and expensive than paintings or sculptures. With the Academies in Europe the gap between fine and applied arts was definitely set, Artist is a descriptive term applied to a person who engages in an activity deemed to be an art. An artist may be defined unofficially as a person who expresses him- or herself through a medium, the word is used in a qualitative sense of, a person creative in, innovative in, or adept at, an artistic practice. Art historians and critics define artists as those who produce art within a recognized or recognizable discipline, contrasting terms for highly skilled workers in media in the applied arts or decorative arts include artisan and specialized terms such as potter, goldsmith or glassblower. Petrus, or Pieter de Jode I or Pieter de Jode the Elder, was a Flemish printmaker, draughtsman and painter active principally active in Antwerp. He was active as a reproductive artist who created many prints after the works of leading painters and was in addition a prolific designer of prints for Antwerp publishers, Pieter de Jode was born in Antwerp as the son of the prominent Dutch-born map maker Gerard de Jode. He received his training in the techniques of drawing and engraving from his father. He studied with Hendrik Goltzius in Haarlem, in the early 1590s he was active in Amsterdam. In Rome in the 1590s he made engravings after works by Titian, Giulio Romano and his engravings of Italian master paintings became a source for Karel van Mander. He spent time in Venice as is documented on a suite of engravings after designs by Maerten de Vos which he made in Venice and was published by Crispijn de Passe. He travelled back home and in 1599 he became a master in the Guild of Saint Luke in Antwerp, in 1631 he travelled to Paris. 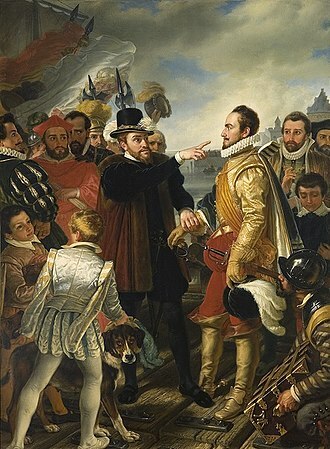 Frederick Henry, Prince of Orange and Ernst Casimir at the Siege of 's-Hertogenbosch in 1629. The Rhetoricians, circa 1655, by Jan Steen. The painting depicts a rederijker reading his poem (blason), while hanging over the balcony the blazon of his chamber of rhetoric can be seen; in this case the Amsterdam society "Egelantier", whose symbol was a wild rose (egelantier) and whose motto was "In Liefde Bloeiend". View of Tivoli at Sunset, 1644, with cows and cowherds as staffage, by Claude Lorrain.